Your business cash inflows. How long does it take you to invoice your customers after you’ve completed the work or delivered your products? How long do your customers take to pay you? Your business cash outflows. How much credit do your suppliers afford you? How soon do you pay your suppliers? The timing of your cash inflows and outflows. The impact of the timing of your cash inflows and outflows on your businesses bank account will affect the growth of your business and its profitability. How to invest the “Extra” cash from improved cash flow and additional profits. Improved cash flow and an increased bank balance will allow more investment in your business, which in turn will improve profitability. 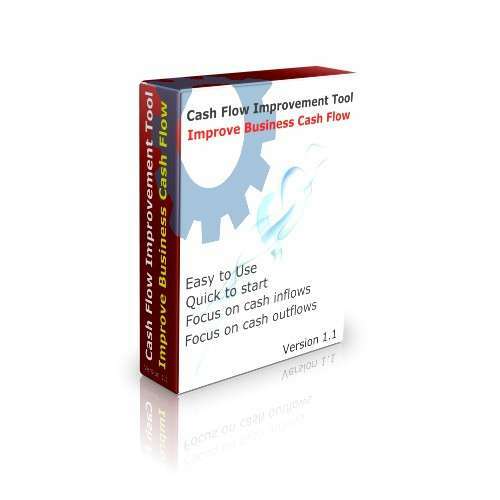 Our free Cash Flow Improvement Tool will help you to focus your mind on your businesses cash ‘inflows’ and business cash ‘outflows. Step back from your business for a moment and look at how long it takes your customers to pay your business. Also, think about how long it takes you to raise your sales invoices after the work has been completed, the longer this takes, the longer it will take to get the cash into your bank account. If for example, it takes you a month to raise the sales invoice, followed by a customer taking say 60 days to pay, you are waiting 90 days, or three months, before the cash is sitting in your bank account. Our Cash Improvement Tool will help you to think about how you could transform your bank balance, and grow your business faster. you can do this by changing how quickly you raise your sales invoices, plus speed up how quickly your customers pay you. In addition to how quickly your cash is flowing into your business, cash flow improvement can come about by agreeing better payment terms with your suppliers. It might be that your suppliers ask you to pay immediately, which could be how things were set up at the startup of your business. However, since then, have you ever revisited this supplier to see if they will give you better payment terms? Alternatively, are there other suppliers, with products equally as good, that will be willing to offer better payment terms? By making changes to your payment terms, can have a significant impact on your business growth. Try our free Cash Flow Improvement Tool, and you’ll be able to see the level of impact on your business. Your business cash inflows from your customers. This can be a two fold improvement:i. How long does it take you to invoice your customers after you’ve completed the work or delivered your products? If this is not done immediately, this adds to the time it takes you to get the funds into your bank account.ii. Once you’ve raised your sales invoice, how long does it take your customers to pay you? If you improve both of these, your bank balance will improve, and your profits will improve too…plus you will grow your business much faster, as you’ll have more funds to invest in its growth. 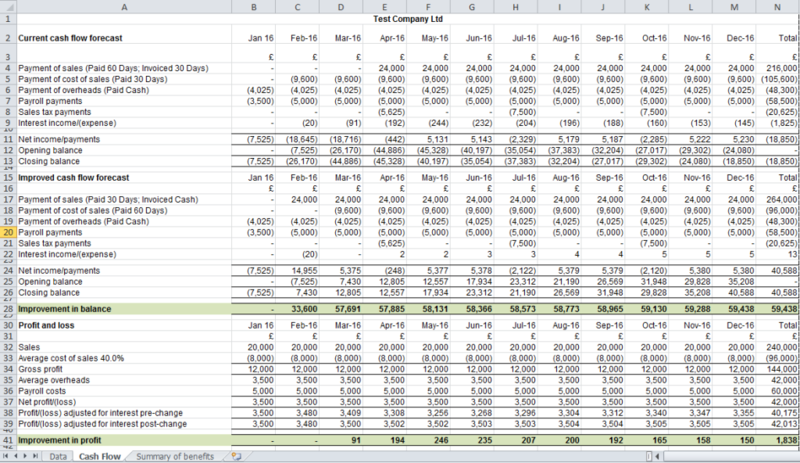 Your business cash outflows. How much credit do your suppliers afford you? How soon do you pay your suppliers? Have you thought about how your cashflows and bank balance could be affect by changing how soon you pay your suppliers. The timing of your cash inflows and outflows. The impact of the timing of your cash inflows and outflows on your businesses bank account, will affect the growth of your business and its profitability. Accelerating your inflows and delaying your outflows will increase your bank balance. How to invest the “Extra” cash from improved cash flow and from additional profits. Improved cash flow and an increased bank balance will allow more investment in your business, which in turn will improve profitability. The more cash you have available, the more you’ll have to invest in its future. This becomes a snow-ball effect on business growth. Test Company Limited with a turnover of £20,000 per month; with a 60% Gross Profit Margin; £3,500 average monthly overheads; £5,000 average monthly wages bill. In the reports show here, the current payment terms are: The company takes 30 days to raise invoices post supply; Customers pay in 60 Days; Suppliers for cost of sales are paid in 30 days; Overheads are paid in cash; The company is registered for VAT (Sales tax); Assumed that deposit interest is 0.2%pa, and overdraft interest is charged at 6.5%pa. 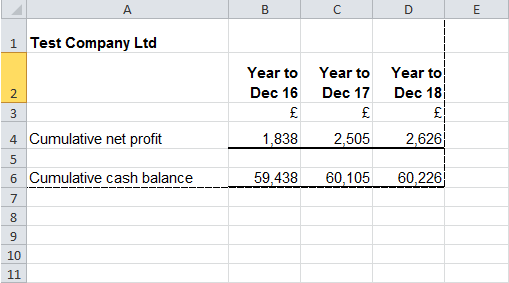 In the reports shown, the following cash flow improvements have been made: Customers are invoiced immediately (Cash); Customers pay in 30 Days; Suppliers for cost of sales have agreed to be paid in 60 Days; Overhead suppliers have agreed to be paid in 30 days, which has led to having £60,226 more cash in the bank in year three. Although the main cash flow impact of the changes happened in year one of £59,438. We recognise that this is a one-off cash flow improvement, but if you utilise the additional cash to invest in your business, you will obtain a snow-balling effect of growth. However, there is also additional profits in the business which is due to extra cash in the bank. All the calculations are done for you with this free business tool and we provide free support at our support form too.